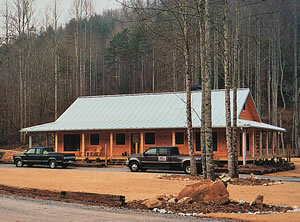 Motorcycle enthusiasts should check out the Iron Horse Motorcycle Lodge near Stecoah in scenic western North Carolina. You won't meet nicer people than owners John and Charlene Powell, who are riders themselves. Their pretty 39-acre resort includes lodge rooms, cabins and a campground, plus covered storage for bikes. Charlene's home-cooked dinners taste great after a full day of riding through the surrounding Great Smoky Mountains. Entrees might include barbecued baby-back ribs or beef Stroganoff, with desserts like chocolate cherry cheesecake. Stecoah is on State Highway 28, about 13 miles southeast of Fontana Village. The Iron Horse Lodge (1755 Lower Stecoah Rd.) is just north of Highway 28. Camping rates are $15 a night for undeveloped sites and $20 for sites with water and electric hookups. Nightly room rates range from $50 to $80 for double occupancy. Reservations are required for rental tents and all rooms. Dinner is available Friday and Saturday, and breakfast on Saturday and Sunday.